3 Nov 2016 – This paper is one of many proposals for a systemic alternative we have published or will be publishing here at the Next System Project. We have commissioned these papers in order to facilitate an informed and comprehensive discussion of “new systems,” and as part of this effort we have also created a comparative framework which provides a basis for evaluating system proposals according to a common set of criteria. Green economy is still a contested concept. At its worst, it simply provides cover for business-as-usual—the escalation of unsustainable corporate practices that threaten the integrity of the natural world and undermine the resource base for future prosperity. At its best, green economy offers a positive blueprint for a new economics: firmly anchored in principles of ecological constraint, social justice, and lasting prosperity. A premise of this piece is that such a blueprint is worth articulating. Explorations of the green economy have until now mostly taken place at a national or international level. This paper addresses the implications of the green economy at the local level. It offers analyses on the conceptual foundations for more sustainable, people-friendly community-based economic activities and presents some empirical evidence for successful implementation of these ideas. A green economy is not an end in itself. Rather, as we argue in section two, it is a means towards a shared and lasting prosperity. But what exactly does prosperity mean? We propose a definition of prosperity in terms of the capabilities that people have to flourish on a finite planet. It is clear that a part of our prosperity depends on material goods and services. Living well clearly means achieving basic levels of material security. But prosperity also has important social and psychological components. Our ability to participate in the life of society is vital. Meaningful employment, satisfying leisure, and a healthy environment also matter. We show how individual prosperity is linked intrinsically to community. Thriving communities are the basis for shared prosperity. A further premise of this essay is that the principal goal of the green economy is to deliver prosperity. In other words, the green economy must deliver the capabilities for individuals to flourish and communities to thrive. Prosperity demands not only the provision of goods and services but also security in employment and stability in markets. Drawing on emerging understandings of the green economy at the macroeconomic level, we identify four specific aspects which are of primary importance to thriving communities: the role of enterprise, the quality of work, the structure of investment, and the nature of the money economy. These aspects of the green economy are explored below. We propose a role for enterprise grounded in providing the capabilities for people to flourish in their communities. First and foremost, of course, these capabilities must include the necessities of life: food, clothing, and shelter. But beyond these needs, our prosperity depends on the “human services” that improve the quality of our lives: health, social care, education, leisure, recreation, and the maintenance, renovation, and protection of physical assets and natural systems. We also explore forms of company structure and organization set up specifically in the interests of community: cooperatives, B corporations, and community and social interest enterprises. The role of work and employment is fundamental to the success of the green economy. Work is more than just the means to a livelihood. It is also a vital ingredient in our connection to each other—part of the “glue” of society. Good work offers respect, motivation, fulfilment, involvement in community, and, in the best case, a sense of meaning and purpose in life. We outline a two-fold strategy for achieving high levels of employment within the green economy. On the one hand, we illustrate the expansion of employment through a “service-enterprise” economy. On the other, we explore the role of reduced working hours in achieving a just distribution of working time. Investment is one of the most important functions for any economy. Protecting the assets on which future well-being depends is an integral component of prosperity. We identify a number of essential targets for investment at the local level. The portfolio of green investment must include: improving energy efficiency and resource productivity, increasing the capacity for a local service enterprise sector, building and maintaining community assets, protecting and enhancing social and natural systems, and developing local renewable energy opportunities. A key finding from our own macroeconomic work on the green economy is that the money economy (the creation, maintenance, and stability of the money supply) is a vital component of sustainability. The unconstrained creation of money through commercial debt stimulates unsustainability in investment and instability in financial markets. In the wake of the financial crisis of 2008/09, with wider capital markets still in disarray, lending constraints hinder green investment and undermine the prosperity of communities. We explore community responses to this dilemma and outline a range of potential institutional innovations, including: community banking, peer-to-peer lending, community bonds, local exchange trading schemes, and the role of sovereign money in directing social investment. The final section of the essay draws together our findings and identifies positive steps towards the creation of green local economies. We explore the opportunities for communities to take independent positive action in pursuit of a green local economy. It would be a mistake, however, to suggest that transformation is possible without wider institutional and infrastructural changes. So, we explore the wider role of governance in stimulating and enabling change and propose an inventory of policy levers that could aid the transition to a green economy. Responding to the dilemma of remaining within ecological limits in a growth-based economy has often been construed primarily as a microeconomic task— one that governments can address with conventional fiscal instruments of tax and subsidy. By these means the “external” costs associated with environmental and social factors would be “internalized” in market prices, according to familiar axioms. More specifically, these conventional arguments claim that incorporating “shadow prices” for environmental goods into market prices will send a clear signal to consumers and investors about the real costs of resource consumption and ecological damage, and incentivize investment in alternatives. But this long-standing prescription has been hard to implement over the last several decades. Even before the crisis, it proved difficult either to forge agreement on fiscal measures to internalize environmental costs or, indeed, to stimulate appropriate levels of private investment in alternative technologies. The financial crisis has certainly made both of these tasks harder. Despite an early focus on “green stimulus” as a way of invigorating the global economy, subsequent responses have failed consistently to address ecological challenges. Fears of damaging economic growth prevent politicians from responding effectively on either ecological taxation or green investment. In fact, fragile private and public sector balance sheets have slowed down investment in the real economy generally, to say nothing of the additional (and less familiar) investment needed to make a transition to a low-carbon economy. Conventional responses focus instead on cutting public spending (austerity) and stimulating consumption growth (consumer spending) as the basis for economic recovery. Unfortunately, these responses tend to ignore the structural problems of the conventional paradigm and delay the investment needed in the green economy. This task—to develop an ecological macroeconomics—is the one we set ourselves to in the aftermath of the crisis.5 The fundamental building blocks of our approach are three-fold. First, we wanted our model to reflect accurately the structure of the real economy—that is, to provide an account of incomes, spending, investment, taxation, demography, and the structure of industry consistent with the United Nations System of National Accounts for any given country. Second, we wanted our framework to make a full and proper account of the ecological and resource constraints on the global economy—as they applied at the scale of the national economy. Finally, we wanted our model to incorporate a consistent description of the financial economy, including the supply of money from and to economic actors, and the effect of the money supply on both nominal and real demand. An ecological macroeconomics must show us not only how much investment is needed—for instance, to reach ecological goals—but also how that investment is to be financed. This last objective was particularly important in the wake of the financial crisis. One of the main shortcomings of conventional economics was its failure to anticipate the impact of fragile balance sheets on the stability of the economy. In fact, most conventional economic models virtually ignore the balance sheet structure of the national economy, in spite of warnings by some far-sighted economists of its importance for economic stability. How is enterprise to be organized? How is labor to be employed? What is the structure of investment? What kind of financial systems are appropriate? What sort of governance structures are relevant? These more foundational questions are, in our view, logically prior to questions about specific industrial sectors like food, energy, transport, or waste. They also speak more closely to the first principles of system change at the economic level. Of course, the results of changes in these cross-cutting dimensions will often reveal themselves at the sectoral level. Most conventional economic models virtually ignore the balance sheet structure of the national economy, in spite of warnings by some economists of its importance. It seems clear that the strength and character of communities lie less in the technologies they employ and more in the social relations they engender. The green economy is not just about resource efficient technology—“treading lightly on the earth”–though this is clearly important. It also encompasses matters of democratization and voice, of social inclusion and justice, and of policy, power, and governance. These questions also lie at the heart of community. Perhaps the most fundamental point of all concerns the ends or purpose our economies are supposed to serve. What is the nature of prosperity itself and how should the economy attempt to deliver this? This question has motivated our own wider work on the green economy and is the starting point for our exploration of the green economy at community scale in this essay. The green economy is not an end in itself; rather, it is a means towards a shared and lasting prosperity. The economy must deliver the capabilities for people to thrive and for communities to flourish. Beyond simply delivering goods and services, this task involves maintaining and enhancing social and environmentalwell-being. Stability in markets, security in employment, ecological integrity, sustainability in supply chains, fairness, and economic justice: these are some of the conditions on which present and future prosperity depends. In the following sections of this essay we will explore in more detail how it might be possible to shape the economic institutions that support these conditions. First, however, we must address a more basic question: what is the nature of prosperity? What does it mean for people and communities to prosper? What exactly are the end goals of the green economy? In defining prosperity as a social and psychological condition, as much as a material one, we have opened up an intriguing possibility: that material bounds do not in themselves constrain prosperity itself; that with appropriate attention to material limits, it may be possible to improve quality of life for everyone, even as we reduce our combined impact on the environment. Though it is clearly essential for the poorest to attain a decent quality of living, the richest may also live better while consuming less. The idea that humans can flourish and at the same time consume less is clearly tantalizing. It would be foolish to think that it is easy to achieve. But equally, it should not be given up lightly. It may well offer the best underlying vision we have for the green economy: prosperity is the art of living well on a finite planet. The Index sets out to measure the quality of life in Canada, using a mixture of subjective and objective indicators in each of these eight domains. Living standards are measured through a selection of relatively conventional economic indicators, including: the post-tax median income of Canadian families, the Royal Bank of Canada’s housing affordability index, and the ratio between the richest and poorest sectors of society. Non-financial measurements are equally important to the index. Community vitality is assessed using indicators of membership in voluntary organizations, time spent in unpaid care of other people, and the rate of violent crimes in the community, for instance. Environmental measures include the level of emissions of greenhouse gases, the consumption of finite resources, local air quality, and the population levels of local species. Making sense of such disparate measurements can sometimes be difficult and combining them into a single index of well-being entails assigning weights that may seem arbitrary. But subjective and objective indicators of prosperity can still provide a useful complement to the more conventional measure of economic consumption or gross value added across the economy. They can also offer important perspectives on the long-term health of the community, beyond the state of the formal economy. Canadian GDP increased 28.9 percent between 1994 and 2010, whereas the Canadian Index of Well-being only increased 5.7 percent. Figure 1 also shows that in several years the indices moved in opposite directions. The CIW is a composite of eight sub-indices, including living standards, community vitality, and environment. Living standards (not shown) dropped precipitously after the 2008/2009 financial crisis, but still remained above the 1994 level. But the subindex for environment was 11 percent lower in 2010 than it had been in 1994. The CIW framework is not just a measurement tool. It can also be a useful input to policy at the community level. For instance, the Resilience Collaborative in Simcoe County, Ontario, has developed a questionnaire based around the CIW indicator set, which they use to identify troubling issues in the community and take proactive steps to resolve them. The key point that emerges from these considerations is that prosperity is more than production and income. Nor is it definable in terms of material abundance. Prosperity transcends material concerns. Rather, it resides in the quality of our lives and in the health and happiness of our families. It is present in the strength of our relationships and our trust in the community. It is evidenced by our satisfaction at work and our sense of shared meaning and purpose. It hangs on our potential to participate fully in the life of society. Prosperity consists in our ability to flourish as human beings on a finite planet. The challenge for the green economy is to create the conditions under which this is possible. From the perspective of our previous discussion, we can identify three core concepts which form the foundations for the green economy. The first is prosperity itself. The pursuit of human well-being lies at the heart of the green economy; it motivates economic activity and justifies economic output. The second is the set of biophysical boundaries within which economic activity must take place, not just for human well-being but also for the well-being of other species with whom humans share the planet. Economic activity which undermines ecological and mineral assets and other natural systems on which prosperity tomorrow depends is unsustainable. The final concept is social justice. Prosperity which provides only for the few and fails to alleviate the plight of the poor and disadvantaged, where there is a clear mismatch between effort and reward, or where the opportunities for advancement are restricted unfairly, diminishes the quality of society and leads eventually to social instability. To put things even more simply, the objective of the green economy is to achieve a shared (socially just) and a lasting (environmentally sustainable) prosperity. The objective of the green economy is to achieve a shared (socially just) and a lasting (environmentally sustainable) prosperity. Though easy enough to articulate conceptually, this vision does not yet define unambiguously the dimensions of the green economy. Nor does it offer a clear macroeconomic framework, distinct from conventional economic thinking and practice. The task of this section is to describe these dimensions more clearly and to suggest how the macroeconomic framework for a green economy differs from the framework for a conventional economy.10 In subsequent sections we shall draw on these macroeconomic principles in order to articulate community-level responses. Economic activity which undermines ecological assets and other natural systems on which prosperity tomorrow depends is unsustainable. The focus on investment as a fundamental element in the green economy is easily justified. Investment plays a crucial role in any economy. Investment is the way in which economics handles the relationship between present and future. There is an Important distinction to be made here between “real investment”—the building of infrastructures, homes, and other physical assets–and “financial investment” in commodities or in property.12 For now, we focus mainly on real investment: the setting aside of resources today in order to build, protect, and enhance the physical assets on which tomorrow’s prosperity depends. So far so good. Investment is as important at the community level as it is at the national level. But how does investment in the green economy differ from investment in the conventional economy? The portfolio of real investment in the green economy highlights low-carbon technologies, resource productivity, and protecting ecological systems (biodiversity and ecosystem services). In the conventional economy, by contrast, investment is aimed at building up and improving the stock of produced assets. Investment today is justified, in the conventional view, on the basis of the economic returns to be gained from these produced assets tomorrow. Returns on investment are expected to flow partly from improvements in productivity—particularly in labor productivity—but also from the development and sale of new consumer products. Capitalism progresses, in the well-known words of the economist Joseph Schumpeter, through a process of “creative destruction”—the continual throwing over of the old in favor of the new.13 Though there are some clear incentives in the existing framework for firms to invest in improved energy efficiency, or increased material productivity along the way, the main objective is to expand the markets for existing products and to build markets for new ones. The end result of the conventional framework is an economic system with several defining characteristics. On a positive note, the economy does become more efficient; the energy and material use per dollar of output often declines over time, due to better equipment and infrastructure as well as an increasing proportion of expenditures on services rather than manufactured products. But paradoxically, these efficiency improvements tend to be overwhelmed by expansions in the scale and diversity of consumer products and services. Historically at least, the overall impact of conventional investment has been to increase material throughput, energy consumption, and environmental impact.14 Finally, and perhaps most importantly for our discussion, such a system relies on continually expanding the demand for consumer commodities. Seen in this light, it becomes clear that achieving a green economy simply through changes in the pattern and focus of investment is far from straightforward. In the first place, the new “green” investments in the protection of ecological systems must be sufficient to offset the expansion of environmental impact associated with conventional investments. This is, of course, easier to achieve the more conventional investment is given over instead to green investment. But, for this shift to take place green investment must be at least as attractive as conventional investment to investors. In purely financial terms, this is a demanding task. Improvements in energy efficiency can be very cost-effective, particularly in the face of rising fuel costs, as many community-based initiatives (see section four) are beginning to show. Some investments in ecological systems, such as protected coasts rather than constructed seawalls, also demonstrate attractive financial returns, even under conventional assumptions. But we must expect that there are also many cases in which green investments have lower, even negative rates of financial return over longer timescales than their counterparts in the resource-intensive, speculative investments of the conventional economy. As long as expected profitability guides most investment decisions, investments with high environmental or social returns but low financial returns will be neglected. To reiterate, green investment is without doubt an essential foundation for the green economy. Making green investment more attractive is something that ca be influenced, in part at least, by the policy landscape. And we address this issue in what follows. But, it also depends crucially on the way in which the money supply works and the financial sector is organized. For now though, the important point to emphasize is that the green economy cannot simply consist of “adding in” a component of green investment to the existing recipe for development and hoping that it will repair the environmental damages of the past and offset all the negative impacts of growth. Something more profound is needed. In fact, the starting point for a more profound reinvention of the economy is clear. It begins with the primary purpose of the green economy: to deliver a shared and lasting prosperity. Our potential to prosper—our ability to flourish as human beings in a thriving community—depends on having the means to a livelihood, the wherewithal to meet our needs and pursue our aspirations. It also demands a degree of security, a sense of belonging, the ability to participate in the community, and the opportunity both to share in a common endeavour and to pursue our potential as individuals. With a little thought we can also begin to characterize the specific economic activities from which the green economy needs to be built. First of all, of course, such activities need to provide the goods and services that contribute to prosperity. To be clear, this is not just about producing and consuming material stuff, but about providing the capabilities for people to flourish in their communities, socially and psychologically, as well as materially. Second, these economic activities must provide decent, satisfying livelihoods for people. Finally, the activities of the green economy need to be low in carbon, efficient in resource use and “tread lightly” on the earth. They must provide the ability for people to flourish and communities to thrive without destroying the ecological systems on which our future prosperity depends. In the next section, we will see how these characteristics provide the basis for a new vision of enterprise: not as a speculative, profit-maximizing division of labor, but as a form of social organization embedded in the community, engaged in delivering the services that improve our quality of life. In the green economy, enterprise must provide real opportunities for meaningful employment; it must be materially light and ecologically sustainable, and yet deliver the capabilities we need in order to prosper: nutrition, health, education, renovation and maintenance, care, craft, culture, and ecological restoration. This vision of community-based, service-oriented enterprise is as important to the green economy as is the concept of green investment. 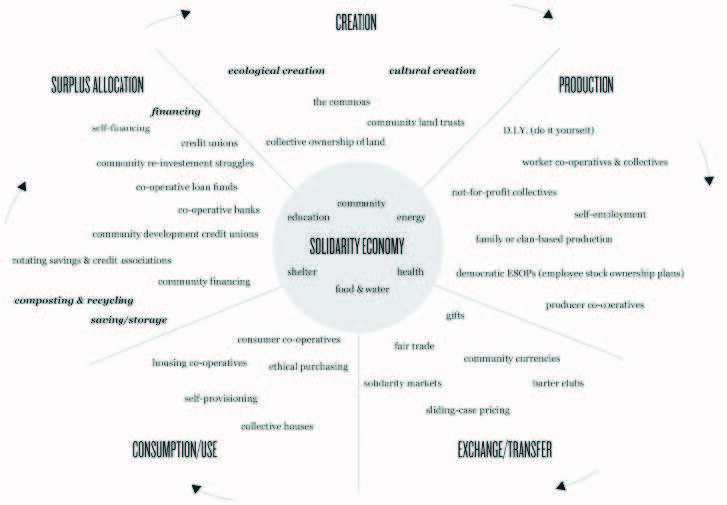 Interestingly, it has much in common with the emerging focus on the “solidarity economy” (Figure 2), a concept finding a surprising support base, from local initiatives such as Solidarity NYC to a programme of research supported by the United Nations Research Institute for Social Development and the International Labour Organisation.17 A key point emphasized by solidarity economy supporters is that the new economy has as much to do with alternative forms of social organizations as it does with the sectoral focus of enterprise. Again, this is something we return to in later sections. In short, the discussion in this section has identified four elements essential to the emergence of a green economy; namely, the role of enterprise, the quality of employment, the structure of investment, and the nature of the money economy. All of these interconnected elements are essential to a shared and lasting prosperity at community scale. In the following pages we explore each of them in more detail, offering both conceptual frameworks for success and some pragmatic examples of the green economy from local communities. contribute to the vitality of the community. Are there specific sectors of economic activity which should be encouraged in the green economy? What organizational form should enterprise take in the green economy? It is not uncommon to find answers to the first of these questions couched in terms of very specific technological sectors, related to energy efficiency, renewable energy, and resource productivity more generally. This response accords with the technological view of the green economy discussed in the previous section: an economy more or less like the existing one, but in which investment transforms the energy infrastructure to low-carbon alternatives. Clearly, in such an economy we would need new energy companies to produce and supply green electricity, energy efficient lights and appliances, and so on. One of the characteristics of these new energy companies is that they tend to be smaller—and often more embedded in the community—than conventional providers. There are several reasons for this. In the first place, many of the green energy companies are recent start-ups, developing new approaches to energy supply and energy efficiency more or less from scratch, unencumbered by sunk capital or entrenched mind-sets. But there is another important reason for this difference. Renewable, sustainable energy sources tend to be local in nature, as do the solutions that will make people’s homes and businesses more energy efficient. Renewable, sustainable energy sources tend to be local in nature, as do the solutions that will make people’s homes and businesses more energy efficient. Financing for community-based energy is critical. It is vital to get the economic conditions right for communities to be able to invest in local solutions to energy needs. We will return to this point in later sections of this essay and explore in more detail the innovations in community-based financing that make such developments possible. Here it is useful to point out another specific feature of these local, community-based energy enterprises. They tend to adopt organizational structures like cooperatives, which differ from the conventional shareholder model of mainstream companies. A focus on community-based energy raises another crucial distinction between conventional enterprise and our vision of enterprise in the green economy. Many community power companies are established as “energy service companies” or ESCOs. Here, the focus is not simply on supplying megawatts, but on delivering the energy services that households and businesses need: heat, light, and motive power. Though at first sight the distinction between energy and energy services might seem opaque, it turns out to be a vital element in the reinvention of enterprise for the green economy. The critical point is this: it is the services that energy can provide–thermal comfort, visual comfort, access–that contribute to our prosperity; rather than oil, gas, or electricity for their own sake. It is entirely possible, for instance, to achieve the same level of thermal comfort in all sorts of ways. Wearing thin clothes in a drafty house and burning lots of gas is one way. Wearing warm clothes in a well insulated house and installing an air source heat pump powered by renewable energy is another. In terms of prosperity, these options may well be equivalent. In terms of resource intensity and environmental impact, they are completely different. Unfortunately, for the most part, the predominant model of energy companies is to maximize the revenues (and subsequent profits) from the sale of energy supplies, rather than to optimize the energy services that contribute to prosperity. What is true for energy companies is also true elsewhere in the green economy. In fact, this distinction between the throughput of material commodities and the delivery of services mirrors precisely the distinction we introduced earlier between material affluence and our ability to flourish—not just in material ways. The fundamental question is this: what would enterprise look like if it were oriented towards providing the capabilities for people to flourish rather than being built around maximizing profits from the sale of material commodities? The example of energy opens up a whole new field of possibilities for the role of enterprise in the community more generally. The idea of enterprise as service has a surprising applicability when it comes to thinking creatively about the green economy. Beyond our material needs, prosperity is as much about social and psychological functioning—identity, affiliation, participation, creativity, and experience—as it is about material stuff. Often, of course, we try to employ material artifacts to satisfy these needs, with greater and lesser degrees of success.21 But the needs themselves are not inherently material, and it is a mistake to cast enterprise solely in terms of the throughput of material products. Rather, we should construe enterprise in the green economy in terms of delivering the “human services” that improve the quality of our lives: health, social care, education, leisure, recreation, and the maintenance and protection of physical and natural assets. As we have indicated, the seeds for this new economy already exist in local, community-based social enterprise: community energy projects, local farmer’s markets, cooperatives of many types, sports clubs, libraries, community health and fitness centers, local repair and maintenance services, craft workshops, writing centers, outdoor pursuits, music and drama, yoga, martial arts, meditation, hairdressing, gardening, and the restoration of parks and open spaces. As we have indicated, the seeds for this new economy already exist in local, community-based social enterprise. Perhaps the most telling point of all is that people often achieve a greater sense of well-being and fulfilment both as producers and as consumers of these activities than they do in the time-poor, materialistic, supermarket economy in which much of our lives is spent.22 Nor is it simply the outputs from these activities that make a positive contribution to flourishing. As we’ve seen above, the form and organization of our systems of provision also matter. Economic organization needs to work with the grain of community and the long-term social good, rather than against it. In summary, this vision of enterprise really does offer a kind of blueprint for a different kind of economy. Enterprise provides for our ability to flourish. It offers the means to a livelihood and to participation in the life of society. It provides security, a sense of belonging, the ability to share in a common endeavour and yet to pursue our potential as individual human beings. And at the same time it offers a decent chance of remaining within ecological scale. This perverse dynamic is internalized in the modern economy through the pursuit of increasing labor productivity: the desire continually to increase the output delivered by each hour of working time. Rising labor productivity is often viewed as the engine of progress in modern capitalist economies. But the relentless pursuit of increased labor productivity also presents society with a profound dilemma. As each hour of working time becomes more “productive,” fewer and fewer people are needed to deliver any given level of economic output. When economic growth is hard to come by, for whatever reason, the dynamic of rising labor productivity is a harsh mistress. There are, broadly speaking, two avenues of intervention through which to escape from this “productivity trap.”28 One is to accept productivity growth in the economy and reap the rewards in terms of reduced hours worked per employee—or, in other words, to share the available work amongst the workforce. The second strategy is to ease up on the gas pedal of ever-increasing productivity—to shift economic activity to more labor-intensive sectors. Interestingly, both these avenues have some precedence in the history of economic ideas. Proposals to shorten the working week are enjoying something of a revival as a way of maintaining full employment with declining or static output. But the idea has a surprisingly long pedigree. In an essay entitled “Economic Possibilities for our Grandchildren” published in 1930, John Maynard Keynes foresaw a time when we would all work less and spend more time with our family, our friends, and our community. Work share makes good sense for both employees and employers. On the other hand, simple arithmetic suggests a second avenue for keeping people in work when demand is rising less quickly. Reining back on the relentless increase in labor productivity offers a compelling option. If labor productivity is no longer continually increasing, and possibly even declining, then the pressure on jobs is considerably lower. By shifting to a lower productivity economy, we have within our grasp the arithmetical means to maintain or increase employment, even as the economy ceases to grow. If this option sounds perverse at first, it is largely because we have become so conditioned by the language of efficiency. Output is everything. Time is money. The drive for increased labor productivity occupies reams of academic literature and haunts the waking hours of CEOs and finance ministers around the world. Quite apart from this ideological tenacity, it’s our ability to generate more output with fewer people that’s lifted our lives out of drudgery and delivered us the cornucopia of material wealth—iPhones, hybrid cars, cheap holiday flights, plasma screen TVs—to which we in the rich world have become accustomed, and to which those in the poor world aspire. Leaving aside here momentarily the environmental impacts of this massive expansion in material throughput, it is clear that rising labor productivity has in some cases made our lives definitively better. At least in the short term. Who now would rather keep their accounts in longhand, wash hotel sheets by hand, or mix concrete with a spade? Between the backbreaking, the demeaning, and the downright boring, increased labor productivity has a lot to commend itself. Even to speak of reducing the time involved in caretaking is to misunderstand its value. Yet this is what the conventional economy continually seeks to do, even in those sectors which rely inherently on human care and attention to achieve their goals. In seeking to make care work more “efficient,” we undermine not only the value of the care but also the experience of the carer. Compassion fatigue is a rising scourge in a health sector hounded by meaningless productivity targets. Health services are often delivered locally but the conditions under which community health operates are invariably framed at the national level. The caring professions are not the only ones to suffer at the hands of productivity goals. Craft is another. It is the accuracy and detail inherent in crafted goods that endows them with lasting value. It is the attention paid by the carpenter, the tailor, and the designer that makes this detail possible. Likewise, it is the time spent practicing, rehearsing, and performing that gives art its enduring appeal. What—aside from meaningless noise—is to be gained by asking the New York Philharmonic to reduce their rehearsal time and play Beethoven’s 9th Symphony faster and faster each year?33 It is true of course, that technological advances have made the appreciation of musical performances more accessible to more people. Yet the performance of music itself and the appreciation of that performance through various media, rely inherently on the musician’s time and dedication to their art. It may not have escaped the reader’s attention that the sectors we are describing here—care, craft, culture—are basically the same “human services” that sit at he heart of the vision of enterprise set out in the previous section. The service enterprise economy inherently resists the productivity trap precisely because the value of the services provided by this sector is tied intimately to the contribution of people’s time, skill, and labor. It is a naturally employment-rich sector which contributes immensely both to individual well-being and to the vibrancy of our communities. Here perhaps is the most remarkable thing of all: since these activities are built around the value of human services rather than the relentless throughput of material stuff, they offer a half decent chance of making the economy more sustainable. In short, achieving full employment in the green economy may have less to do with chasing after endless productivity growth and more to do with building local economies based around care, craft, and culture; and in doing so, restoring the value of decent work to its rightful place at the heart of society. Investment may be the single most important element in the green economy: it embodies the relationship between the present and the future. The fact that people set aside a proportion of their income for investment at all reflects a fundamentally prudential aspect of human nature. We care not just about our present happiness but also about our future well-being.34 Prosperity today means little, as we have already suggested, if it undermines prosperity tomorrow. Investment is the vehicle through which we build, protect, and maintain the assets on which tomorrow’s prosperity depends. Of course it is always possible for this relationship between present and future to become distorted. We can become too short sighted—both as individuals and as a society. We sometimes privilege risky speculation—practices which are fundamentally a form of gambling—over the investments that create and maintain solid, long-lasting physical, social, and environmental assets. We may create rules that privilege existing asset holders at the expense of the poorest in society. Our investment architectures are sometimes so complex that it becomes impossible for individuals and communities to manage their own long-term financial security. We often set aside too little to protect the most important long-term assets of all: those provided by natural ecosystems. It is important to understand both how these mistakes can become institutionalized and also how to correct them. Corrective measures at a federal or provincial level need to be complemented by workable alternatives that can return a measure of resilience to local communities. The green economy needs not just a coherent vision of sustainable investment, but a way of translating this vision into practice at community scale. Corrective measures at a federal or provincial level need to be complemented by workable alternatives that can return a measure of resilience to local communities. These reflections lead us towards two specific tasks. One is to articulate an appropriate portfolio for investment in the green economy. The second is to outline an appropriate financial framework to support this kind of investment. The current section is primarily addressed towards the former task, while the latter task is the subject of the next section. But before engaging in the job of developing an “investment portfolio” for the green economy—and illustrating it with examples at community scale—we outline very briefly the driving dynamic of investment in the conventional economy. In simple terms, we can characterize “real investment” in the conventional economy as pursuing three main objectives.35 First, it aims to maintain (and, where necessary, replace or expand) the existing stock of fixed assets. Second, it attempts to improve the productivity of those assets—most often, as we have noted, through the pursuit of increased labor productivity. Finally, investment is directed towards the process of “creative destruction” identified earlier—the creation and re-creation of new markets for new products, the continual throwing over of the old in favor of the new. In short, conventional investment strategy is a crucial part of the architecture of the unsustainable economy and offers little in the way of a reliable basis for the green economy.36 To reiterate a point we made earlier, the green economy cannot simply be characterized as more of the same with a smattering of cleantech investments thrown in. Certainly investments in low-carbon, resource light technologies rightly belong in a green investment portfolio. But a more thorough rethink of the portfolio as a whole is also needed. Prosperity consists in our ability to flourish as human beings—now and in the future. Enterprise concerns the organization of economic services which deliver the capabilities we need to flourish. Investment is the process of setting aside income in the present in order to maintain, protect, and enhance the assets from which future prosperity will flow. This vision allows us first and foremost to identify the kinds of assets (and the kinds of enterprises) towards which we need investment funds to flow. The provision of our basic material needs is the baseline for prosperity. Beyond this baseline we should invest, for example, in health, in education, in social care, in leisure and recreation; in green spaces, lakes and rivers, parks and gardens; in community halls, concert halls, theatres, museums and libraries. The broad aim of this portfolio is to build and maintain the physical assets and natural systems through which individuals can flourish and communities can thrive–with as little in the way of material throughput as possible. There’s an interesting feature of this kind of investment target. Many of the underlying needs are best articulated—and most effectively delivered—at the local level. Consequently, this investment strategy works best at community scale. Of course, it also requires appropriate financial vehicles to enable it to work effectively. We return to this point in the following section. We note here only that the rewards of engaging in such a strategy at community scale can include lasting benefits in terms of community regeneration, local self-reliance, and community resilience, over and above the prudential rewards of building and maintaining community assets. Investment in the green economy needs to be focused on the protection and maintenance of the assets on which future prosperity depends. Investment in the green economy needs to be focused on the protection and maintenance of the assets on which future prosperity depends. The portfolio of green investment must of course include the low-carbon technology and infrastructure typically associated with the green economy. But it must also include wider investments in resource productivity, in building human and social capital, in the protection of ecological systems, in the building of community infrastructures, and in the maintenance of public spaces. Investment is also essential to support the economic activities which deliver meaningful human services to society. What emerges from this exploration is that the conventional view of a straightforward relationship between investment expenditure and the productivity of the economy no longer holds in the same way for green investment. Simplistic prescriptions in which investment contributes to future productivity won’t work here. The ecology of investment will itself have to change in the green economy. Investment in long-term, public goods will have to be judged against criteria other than financial market success. This may also mean rethinking the ownership of assets and the distribution of surpluses from them. In summary, the biggest challenge for this new portfolio of investment is the question of financing. It is to this subject that we now turn. The money economy is a term used to describe the wider set of financial flows on which the real economy depends. This wider set of financial accounts includes the flow of money into and out of different economic sectors, the processes of borrowing, lending, creating money (the money supply), and the changes in the financial assets and liabilities of different economic actors. These money flows are essential to the financing of investments in the real economy. It became apparent through the crisis that sustainability—indeed, basic economic security—depends on a healthy financial system. Prosperity itself depends on a properly functioning money system. Restoring stability to the financial system has to be an element in the green economy. Paradoxically, in the wake of the crisis, with wider financial markets still in disarray, prosperity becomes even more difficult to achieve. Lending constraints hinder green investment and undermine the quality of our lives and the resilience of our communities. Most economic textbooks suggest that banks make loans based on deposits they have received from savers. But the reality is that when a bank agrees to create a loan to a business or a household it simply enters the amount as a loan on the asset side of its balance sheet and the same amount as a deposit on the liability side of its balance sheet. This deposit is then available to spend on goods and services in the economy. In other words, directly contrary to the textbook view, banks create money by making loans. This process is said to “expand the balance sheet,” but it doesn’t in itself change the financial net worth (the difference between assets and liabilities) of the bank. Any change in the financial worth of the bank from making a loan depends on what happens after the loan is created: how much interest is charged on it, whether and when the loan is repaid, how much of the deposit is spent, where it is spent, where that money ends up in the economy. If the loan is repaid in good time at an interest rate favorable to the bank, it increases bank profits and boosts its financial worth. If the borrower defaults on the loan, the transaction will leave the bank with “toxic” assets—loans that are non-recoverable—which will reduce its financial worth. There are a number of important implications of this debt-based money system. One of them is that the investments that are needed for the green economy must generally prove their creditworthiness on entirely commercial grounds and must compete for capital with all sorts of commercial investments. Potential green investments may have high social and environmental returns, but unless they also have attractive financial returns—an unlikely case—they typically won’t be funded through commercial channels. Some of these competing investments will offer highly attractive rates of return in the short term, even though in the longer term they are entirely unsustainable. So, for example, green investments must compete with financial speculation (a form of legalised gambling) in commodities, property or financial assets. They must compete with unsustainable consumer lending—in which repayment (and punishment for non-payment) is reinforced by legal institutions. They must compete with investments in dirty, extractive industries that degrade the environment, and operate through supply chains profitable only because they involve child labor. The social benefits of green investment are rarely factored into the commercial market. Neither are the social costs of unsustainable investment (including the huge cost of unrestrained speculative trading). Worse still, these social costs are often ultimately borne by the taxpayer rather than by the investors. The ethical basis of green investment only rarely attracts a premium. There are examples of banks who have sought out this premium or who are even prepared to lend at lower than market rates of return specifically to green or sustainable projects, but this is a very small proportion of contemporary banking activity. Seeking funding from the ethical banking sector is one way in which communities can begin to finance the investments needed for a green economy. They might also look to attract public funding from community development financial institutions and credit unions, as well as federal, provincial, or municipal governments. The benefits to the nation as a whole from having strong, resilient, and sustainable communities are self-evident, and there are indeed federal and provincial government schemes to offer finance. A prime example of this kind of funder is Sustainable Development Technology Canada (SDTC), a not-for-profit organization funded by the federal government which aims to support innovative green technologies for climate change, clean air, water quality, and soils. Inevitably though, the ability of government to engage in community financing is dependent on its own fiscal position; and this in turn depends, in part, on the performance of the national economy. When economic growth is harder to come by, for whatever reason, government tax receipts are lower, and social security and employment insurance costs tend to be higher. Deficit spending is likely to rise; the national debt increases and, under the existing system in which government itself must also compete for funding on commercial money markets, the interest payments on the debt further constrain government spending. This rule—sometimes called the fundamental national accounting identity—flows directly from the understanding that every financial asset has a corresponding financial liability somewhere in the economy. And every change in a financial asset in one place has a corresponding change in a liability somewhere else. Any increase in the net financial wealth of the private sector must be accompanied by a corresponding decrease, either in the net financial wealth of government or in the net financial wealth of the overseas sector. To be clear, this rule applies to the financial position of the sectors as a whole. It does not rule out changes in indebtedness within a sector. So households can become increasingly indebted to private corporations without affecting the net indebtedness of the private sector, which includes households and private corporations. Such accounting identities are surprisingly informative about the available responses to fiscal constraint and the potential for green investment. For example, when exports and imports are about equal, so that there is no net overseas lending or borrowing, the national accounting identity informs us that net private lending is equal to the government deficit. Political calls to increase private net lending (for instance, by encouraging private firms and households to save more) and simultaneously to reduce the government deficit are contradictory and misinformed. An improvement in the private sector’s position can only be achieved through a worsening of the public sector’s position and vice versa. Political calls to increase private net lending (for instance, by encouraging private firms and households to save more) and simultaneously to reduce the government deficit are contradictory and misinformed. One of the reasons that the UK, for example, has suffered from what was effectively a triple dip recession, is that the government attempted a radical program of fiscal consolidation (mainly through spending cuts), at the same time as private sector institutions were trying to shore up their balance sheets (i.e. increase net savings). Not only did the strategy backfire in terms of sovereign debt reduction, it withdrew vital social investment from communities just when it was most needed. In a country such as Germany, with a strong export sector and a significant trade surplus, this strategy might indeed work. In a country with a long-running trade deficit, such as the UK (or worse still, Greece), it is simply impossible for both the private and the public sector simultaneously to improve their net financial positions. Surprisingly, these understandings about the monetary rules that govern the macro-economy have only recently (and then only partially) made their way into mainstream thinking—too late for some countries to avoid severe economic hardship, possibly for decades. The implications at the community level have barely yet been touched on—aside from a realization that when social investment is withdrawn by government in a misguided attempt to manage sovereign (national) debt, it is the poorest communities which often suffer first. Though there is no formal equivalent to the national accounting identity at the local level, the same broad principle might be said to hold—namely that regions and communities should aim for balanced trade positions: to buy from other regions, taken as a group, about as much as they sell to them. This principle would certainly accord with one of our core principles for the green economy. Social justice—an equitable and fair distribution of access to goods and services—is the basis for shared prosperity. Prosperity in one region at the expense of high levels of indebtedness in another region flies in the face of social justice, and has no place in a green economy. Beyond this “rule of thumb” for balanced trade at community scale, we can also say something about the balance between private and public finances. Once trade is more or less balanced, the accounting identity informs us that net private sector savings are more or less equal to the net public sector deficit. The only way to avoid a rising public sector debt (i.e. consistent public sector deficits) is to avoid excessive accumulation of private financial assets (i.e. consistent positive private net lending). Again, this point is reinforced by considerations of social justice. It is almost tautological to say that it is the richest in society who are most easily capable of achieving high levels of net financial lending and accumulating net financial worth. Public debts (and the interest on them), on the other hand, are paid by every single taxpayer, rich and poor alike. The possibility that private net financial wealth can only be achieved at the expense of net public financial debt puts an uncomfortable moral frame around the accumulation of private financial wealth. The possibility that private net financial wealth can only be achieved at the expense of net public financial debt puts an uncomfortable moral frame around the accumulation of private financial wealth. This is particularly true in a monetary system in which sovereign (national) debt must be financed from open money markets at commercial interest rates. There is a clear risk that the costs to the taxpayer of maintaining the public debt are paid to precisely the people who benefit most from its existence. The combination of a debt-based money supply and an accumulation of private financial assets is deeply regressive. It also makes financing green investment very difficult. On the other hand, there are some clear signals about the appropriate direction to turn to improve the situation. Here we highlight three particularly important social innovations that are supported strongly by this analysis. The first is impact investing—the reinvestment of private net savings into the green economy. The second is community banking and credit unions—the implementation of local savings and investment vehicles that plough benefits directly back into the community. The third is the reconfiguring of the money supply itself, reclaiming control of the money supply from commercial interests and returning it to either the public sector (government) or the community, giving them access to debt-free money. Perhaps the most popular model for community investment is the credit union— financial institutions in which individual members pool their savings to provide loans to other members. Though subject to many of the same regulations as banks, credit unions are typically smaller, more local, and designed specifically to be nonprofit institutions. They therefore offer a particularly appropriate vehicle for green investment at community scale and are beginning to be adopted for this purpose. Our final suggestion for leveraging finance towards green investment at community scale concerns the money supply itself. This might seem at first sight a rather intractable aspect of the existing money system. However, there are some rather strong arguments in favor of changing the existing debt-based money system and returning a greater degree of control to the government. Some of these arguments have a surprising pedigree. It is an open question whether LETS can leverage sufficient levels of capital to create green economies at community scale. There are certainly some people who regard these local currencies as offering the potential to build more independent, resilient, and sustainable communities, particularly in the face of difficult—and potentially unstable—conditions in financial markets. But it would be foolish to be led by romantic notions of local self-reliance away from the need to reform institutions at the wider structural level. It would be foolish to be led by romantic notions of local self-reliance away from the need to reform institutions at the wider structural level. What is also unclear is the extent to which such examples can be scaled up (either in scope or in number) to form the basis of a genuine transformation of the larger financial system. What we have attempted to show here is that these kinds of local initiatives are clearly consistent with our findings about financial architecture from the macroeconomic level. They point the way towards more far-reaching changes. For instance, they highlight the need to redirect investment away from commodity price speculation and investment in extractive industries towards those that reduce our impact on the planet and strengthen local community.But, they also depend to some extent on broader system-level change for their success. Thus, we have also stressed here the legitimate role for community in campaigning for such change. Irrespective of these considerations, it should be clear from the discussion in this section that the green economy demands a different financial landscape from the one that led to the financial crisis of 2008/9. Fiscal, sectoral, and trade imbalances impede green investment and stand in the way of shared prosperity. Reforming this system is vital. Long-term security has to be prioritized over short-term gain. Social and ecological returns must be factored into investment decisions alongside conventional financial returns. Improving the ability of people to invest their savings locally, to the benefit of their own community, is paramount. In short, reforming capital markets is not just the most obvious response to the financial crisis, it is also an essential foundation for a new green economy at community scale. The broad aim of this essay was to explore the implications of emerging ideas about the “green economy” as they apply to local communities. The starting point for this exploration was a vision of prosperity as a shared endeavor: the ability to live well on a finite planet. In contrast to contemporary notions of prosperity cast in terms of individuals’ short-term access to material abundance, we have highlighted (in section two) both the shared, social dimensions of prosperity and the importance of longevity over time. Prosperity today is an empty promise if it consistently undermines the conditions on which prosperity tomorrow depends. Our essay then turned its attention to the demands that this vision of prosperity places on the economic structure and institutions of the green economy. We outlined briefly the demands of achieving a green economy and contrasted this with some contemporary framings of the green economy debate. Four specific features of the green economy emerged from this exploration: the nature of enterprise in delivering the services that maintain and improve our quality of life; the place and quality of work in people’s lives; the role of investment in protecting and maintaining the assets from which future services flow; and the structure of the money economy in which savings, investment,and debt are negotiated. We examined each of these four key elements of the green economy in turn, teasing out the institutional implications at the scale of the community, and offering numerous illustrations from local examples and case studies. Together, these explorations provide a remarkably coherent vision for the green economy at community scale. It will not have gone unnoticed, however, that many of the interventions envisioned in this piece cannot be implemented at will without more far-reaching changes in the broader political and economic framework. The question of governance, broadly defined, becomes critical to the delivery of the green economy. In this final section of the paper we therefore address some of the challenges of government action in relation to the green economy, particularly at community scale. Much of the motivation for exploring the green economy comes from recognizing the growing impacts of humans on the biosphere, globally and regionally. Some of these impacts, such as climate change, arise from the increasing use of fossil fuels and the efforts to obtain them from remote and risky locations in oil sands, deep rock formations, and under the sea. Other impacts, though often ubiquitous in occurrence—in the sense that they are happening all over the world—are nonetheless local in the impact. Scarcity of fresh water is one example. Urban air pollution is another. The speed and scale of losses in biodiversity have both local and global impacts. All of these problems are ultimately experienced by people living in communities, even though they cannot be solved entirely (and in many cases, not mainly) by action at the community level. Wider levels of government play a key role in framing the issues, setting the agenda, and providing initiatives. To a large extent, governments at the provincial, state, and the national levels determine which policy issues are up for discussion and action and which are not. People are often locked in to unsustainable patterns of production and consumption through a complex mixture of factors, some of them institutional, some of them economic, some of them to do with infrastructure or lack of infrastructure, and some of them social or psychological in nature. The rhetoric of “consumer sovereignty” does not help much here because it regards choice as individualistic and fails to unravel the social, psychological, and institutional influences on private behaviors. Some behaviors are indeed motivated by rational self-interest. But conventional responses neither do justice to the complexity of consumer behavior nor exhaust the possibilities for policy intervention in pursuit of social change. In short, a concerted strategy is needed to make change possible, to: ensure that incentive structures and institutional rules favor the green economy; enable access to appropriate infrastructures, technologies, and opportunities; engage people in initiatives to help themselves; and, exemplify the desired changes within government’s own policies and practices. We outline these suggestions with examples drawn from policy and practice. government’s own environmental and social performance. It is important to note here that government’s role as lawmaker is not confined to punitive regulation. As we covered in section five, changes to labor law that incentivize employers and give employees rights to shorter hours can be critical to providing decent work and maintaining high employment levels. Of particular importance to the green economy is government’s role in financing investments in infrastructure with long time horizons and significant non-financial returns. This challenge necessarily lies beyond the scope of individual communities to achieve in isolation. A further task for government lies in the coordination of multiple communities; for example, to implement programs to develop renewable energy or reduce material throughput. All of this supposes, of course, that government itself is willing and able to act in pursuit of change. In the absence of such willingness, there may be little that communities acting on their own can do to resolve some of the institutional roadblocks. Many key economic decisions that affect communities are taken at a larger scale, not infrequently beyond the direct control of individual national governments. Global companies can direct their investment wherever they choose. Communities can exert some influence through land use planning to determine where certain activities cannot happen and provincial and municipal governments can offer incentives and inducements to attract investment. But they cannot oblige private corporations to invest. They are often forced into competition to make themselves more attractive than competing locations. This may serve the interests of the corporations but not necessarily those of communities, especially those wishing to develop green economies. The emergence of global corporations with financial resources to match or even surpass those of governments has changed the way we think about the relationship between people, their communities, their governments, and the economy. For well over a century some scholars and political commentators have recognized that political and economic systems are intertwined. In communist and fascist states this is obvious, since it is deliberate. In capitalist states it is less so. Many mainstream economists and leaders in the business sector like to promulgate the fiction that governments establish policy which the private sector follows. Little is said about the capture of government agencies by the groups they are supposed to regulate. Not much attention is given to the impact of lobbying on government policy or on the effects of giving public servants experience in the private sector and vice versa. Indeed, both are encouraged. The language of business has infiltrated the public sector. Government departments have “business plans,” stress “core competencies” and serve “clients.” Influence in the other direction is less obvious. Some private corporations have “sustainability plans,” pursue the “triple bottom line” and conduct themselves in a “socially responsible manner.” But sustainability in this framing is first and foremost about specific businesses or communities, rather than the wider systems of which they are a part. The triple bottom line works well as long as the financial bottom line is not compromised, and social responsibility is not constrained by corporate responsibilities to meet shareholder and market expectations for profits. It is clear that communities do change over time, sometimes extensively. As we showed in section two, these changes can be guided by the interests of local communities and progress can be measured. Air quality has improved in many urban areas, recycling rates have risen, water quality is better. Admittedly, it is not all good news. Unemployment rates, especially among the young, are high, income and wealth inequality is rising, and work has become more precarious. Rural communities have changed as well. Family farms are in decline, genetically modified crops and animals pose new threats to ecological integrity, and native biodiversity is under threat. The apparent intractability of human behavior is in part a function of the policy model that has dominated conventional thinking on pro-environmental and pro-social change. But the evidence suggests that this model is inaccurate. Admittedly, the challenges of implementing the green economy at community scale are significant. The apparent intractability of human behavior is in part a function of the policy model that has dominated conventional thinking on pro-environmental and pro-social change. But the evidence suggests that this model is inaccurate. Despite the rhetoric of modern “hands-off” governance, policy intervenes continually in the behavior of individuals both directly (through taxes, regulations, and incentives) and (more importantly) through its extensive influence over the social and institutional context. Governments are not just innocent bystanders in the negotiation of economic progress. They influence and co-create the culture of change in a variety of ways. In some cases, this influence proceeds through specific interventions—such as the imposition of regulatory and fiscal structures. In other cases it proceeds through the absence of regulations and incentives. Most often it proceeds through a combination of the ways in which government intervenes and the ways in which it chooses not to. As this review has attempted to demonstrate, a genuine understanding of the social and institutional context of the green economy opens up a much more creative vista for policy innovation than has hitherto been recognized. Expanding on these opportunities is an urgent responsibility of government. In summary, it might be tempting to conclude that transforming local economies is beyond the power of individuals, of communities, or, indeed, of government itself. In our view, this conclusion would be mistaken. We have argued in this paper, first, that there is a meaningful concept of the green economy that has clear relevance at community scale. In addition, we have shown that this concept has specific implications for how enterprise is conceived, how work is organized, how investment is structured, and how the money system can be made to operate in the service of society. We have argued that these concrete proposals for change are not only implementable, but are already in many places actually being implemented. These kinds of changes are already improving the quality of people’s lives and increasing the resilience of their communities. Clearly, there is no silver bullet, no universal fix that will easily transform communities for the better. But identifying and implementing action for change is never simple in reality. Rather, the points of intervention will be diverse and depend both on the needs of the community and the skills and opportunities of those involved. For some, the route to implementation may involve setting up a local food cooperative or improving the quality and quantity of urban gardens. For others, it might mean establishing a community-based renewable energy project. For entrepreneurs, the process may start with a simple inquiry into the sustainability of the supply chain or the social value of the product. For teachers, it might involve changes in the curriculum. For health professionals, it might mean getting involved in community health. For investors, it might start by drawing a line in the sand: shifting money from speculative or environmentally destructive portfolios towards positive investments in change. Individual choices about what to buy, or how to travel, or where to save have cumulative impacts on the boundaries of possibility. For the activist, change might mean protest; for the policy-maker, it may involve painstaking reform. For academic economists, the process of change might well start by asking the simple question: how does an economy work when it isn’t being driven by relentless growth in material consumption? This was the question we asked ourselves several years ago and to which we have dedicated much of our work together. We are still some way from definitive answers to that question, but the lessons we have learned along the way have already been useful—not least in developing the arguments in this essay. 1. ↑ This essay is a revised version of Tim Jackson and Peter A. Victor, “Green Economy at Community Scale,” a Report to the Metcalf Foundation, 2013, http://metcalffoundation.com/wp-content/uploads/2013/10/GreenEconomy.pdf. The authors are grateful to Gus Speth for his encouragement and extensive editorial suggestions. Responsibility for any errors rests with the authors. 3. ↑ Tim Jackson, Prosperity without Growth: Economics for a Finite Planet (London: Earthscan/Routledge, 2009); Peter Victor, Managing without Growth: Slower by Design, Not Disaster (Cheltenham: Edward Elgar, 2008); Tim Jackson and Peter Victor, “Productivity and Work in the Green Economy: Some Theoretical Reflections and Empirical Tests,” Environmental Innovation and Societal Transitions 1, 1 (2011): 101-108. 4. ↑ For a summary of our arguments for an ecological macroeconomics, see: Jackson, Prosperity without Growth: Economics for a Finite Planet; Victor, Managing without Growth; Tim Jackson, Peter Victor, and A. Asjad Naqvi, “Towards a Stock – Flow Consistent Ecological Macroeconomics,” Working Paper no 114 (Vienna: WWWforEurope, 2016). 6. ↑ For the purposes of this report, we understand community to mean a group of people located in proximity to one another with shared values and interests. 7. 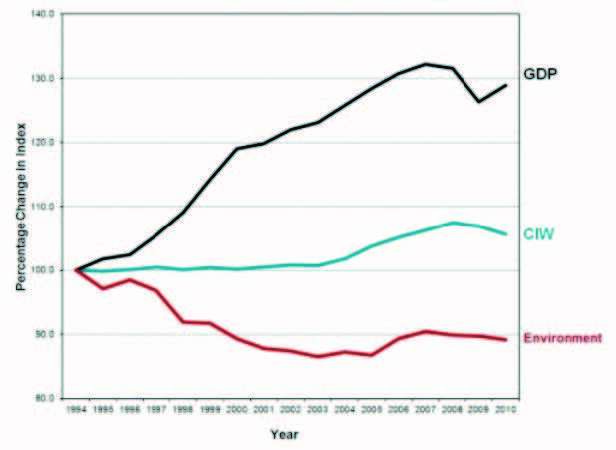 ↑ Canadian Index of Wellbeing, “How are Canadians Really Doing? The 2012 CIW Report” (Waterloo, ON: Canadian Index of Wellbeing and University of Waterloo, 2012). 8. ↑ For an overview of the most well known of the “adjusted” GDP measures, see: Ida Kubiszewski, Robert Costanza et. al., “Beyond GDP: Measuring and Achieving Global Genuine Progress,” Ecological Economics 93 (2013): 57-68. 9. ↑ United Nations Environment Programme (UNEP), “Towards a Green Economy” (Paris: United Nations Environment Programme,” 2012): 16. 10. ↑ These suggestions draw in part from our own previous publications (Jackson, Prosperity without Growth: Economics for a Finite Planet/Tim Jackson, Prosperity without Growth: Foundations for the Economy of Tomorrow ( New York and London: Routledge, 2016); Victor, Managing without Growth) and in part from our on-going work together to define a macroeconomic model of the green economy (Tim Jackson and Peter Victor, “Does Credit Create a Growth Imperative? A Quasi-steady State Economy with Interest-bearing Debt,” Ecological Economics 120 (2015): 32– 48; Tim Jackson and Peter Victor, “Does Slow Growth Lead to Rising Inequality? Some Theoretical Reflections and Numerical Simulations,” Ecological Economics 121 (2016): 206–219; Jackson, “Towards a Stock – Flow Consistent Ecological Macroeconomics.”). 11. ↑ UNEP, “Towards a Green Economy,” 16. 12. ↑ Sometimes called fixed capital formation. 13. ↑ Joseph Schumpeter, Capitalism, Socialism and Democracy (New York: Harper Row, 1975). 14. ↑ See Jackson, Prosperity without Growth (2009/2016), Chapter 5 for an in-depth discussion of this point. 15. ↑ Richard Wilkinson and Kate Pickett, The Spirit Level: Why Equality is Better for Everyone (London: Penguin Books, 2009). 16. ↑ Jackson, Prosperity without Growth (2009/2016), Chapter 6. 17. ↑ See for example: United Nations Research Institute for Social Development, “Potential and Limits of Social and Solidarity Economy,” Conference Video and Program,” May 6-8, 2013, http://www.unrisd.org/80256B3C005BD6AB/%28httpEvents%29/513E84D6BA2D56EEC1257AFA00469157?OpenDocument. 18. ↑ Bullfrog Power, http://www.bullfrogpower.com/about/mission.cfm. 19. ↑ Good Energy, http://www.goodenergy.co.uk/. 20. ↑ For further examples of community power in Ontario and elsewhere see, for instance, Independent Electricity System Operator, “Aboriginal Energy Partnerships Program,” http://www.communityenergyprogram.ca/Resources/ResourcesCommunityPower.aspx. 21. ↑ See Jackson, Prosperity without Growth (2009/2016), Chapter 6 for a more extensive discussion of this point. 22. ↑ See Davy Castel, Claude Lemoine, and Annick Durand-Delvigne, “Working in Cooperatives and Social Economy: Effects on Job Satisfaction and the Meaning of Work,” Perspectives interdisciplinaires sur le travail et la santé 13-2 (2011), http://pistes.revues.org/2635. 23. ↑ Quoted in Ernst Friedrich Schumacher, Small is Beautiful (London: Vintage Books, 1973), 40. 24. ↑ Schumacher, Small is Beautiful. 25. ↑ Schumacher, Small is Beautiful. 26. ↑ In Section 7 we explore briefly an alternative view on this. 27. ↑ For a fuller discussion of this, see: Jackson, Prosperity without Growth (2009/2016), Victor, Managing without Growth. 28. ↑ See Tim Jackson and Peter Victor, “Productivity and Work in the Green Economy: Some Theoretical Reflections and Empirical Tests,” Environmental Innovation and Societal Transitions 1, 1 (2011): 101-108. 29. ↑ Data from the Organisation for Economic Co-operation and Development (OECD), OECDStatdatabase, online at: http://stats.oecd.org/Index.aspx?DatasetCode=ANHRS. 30. ↑ See Victor, Managing without Growth, 157-158. 31. ↑ Anna Coote, Jane Franklin, and the New Economics Foundation, “Time on Our Side: Why weall need a Shorter Working Week” (London: New Economics Foundation, 2013), http://neweconomics.org/sites/neweconomics.org/files/About_Time_conference_note.pdf. 32. ↑ This is not to suggest, of course, that material and technical advances in the caring professions are insignificant. On the contrary, some of these represent a direct contribution to improved quality of care. Our point is only to note that these advances should not tempt us to sacrifice the quality of care that comes from the time spent by caregivers. 33. ↑ Tim Jackson, “Let’s Be Less Productive,” The New York Times , May 26, 2012, http://www.nytimes.com/2012/05/27/opinion/sunday/lets-be-less-productive.html?_r=0. 34. ↑ It is interesting to note that prudential behavior is not restricted to the human species. Many species exhibit behaviors which might broadly be regarded as investment behaviors. Beavers build dams; squirrels horde nuts; camels store water. Each of these activities carries a current cost, but reaps future dividends. Nor is this behavior restricted to mammals; nest-building is a basic activity for birds, bees, termites, ants, and wasps. Even plants invest: the energy that is required to produce brightly colored flowers carries a vital return for plants in terms of pollination. 35. ↑ As in section three, we distinguish “real investment”—as the flow of capital into fixed (physical) assets—from speculative financial investment—the trading of commodities, property, and financial assets. We explore this distinction further in section seven. 36. ↑ When, in addition, we consider speculative investment, conventional investment portfolios appear even more destructive, contributing not only to resource depletion and environmental degradation but even—as we say in the global financial crisis—to financial instability. 38. ↑ The GDP can be measured equivalently in terms of spending, income, or value added. 39. ↑ The crisis affected banks first because they had extended very high levels of credit to people who could not afford to repay it, and had failed to maintain enough resilience in their balance sheet to protect themselves. In the language of financial markets, they were “over-leveraged.” When households began to default on loans, a rapid decline in the asset value of the banks in relation to their liabilities triggered a massive loss of confidence. One after another, the most vulnerable banks found their balance sheets “under water,” with liabilities vastly exceeding assets. 40. ↑ The reader interested in more detail on the workings of the money economy might usefully refer to several recent publications in this field, including: Josh Ryan-Collins, Tony Greenham, and the New Economics Foundation, Where Does Money Come From? (London: New Economics Foundation, 2012); Andrew Jackson and Ben Dyson, Modernising Money—Why our Monetary System is Broken and How it Can be Fixed (London: Positive Money, 2012); Randall Wray, Modern Money Theory (Oxford: Palgrave Macmillan, 2012). 41. ↑ Data are from the Bank for International Settlements, http://www.bis.org/statistics/totcredit/credpriv_doc.pdf. 42. ↑ The so called “national accounting identity” is usually expressed formally as (S – I) = (G – T) + (X – M), where S = private savings, I = private investment, G = government spending, T = Taxation, X = exports and M = imports. S-I is then net private savings; T – G is net government saving (G – T is net borrowing); and M – X is net overseas saving. 43. ↑ This is particularly true in a region with a single currency or a fixed currency regime, as George Soros has pointed out in the case of Germany. See: Adrian Croft, “European Recession Next Year ‘Almost Inevitable’ – Soros,” Reuters, June 15, 2014, http://www.reuters.com/article/2010/06/15/uk-britain-soros-idUKTRE65E5JT20100615. 44. ↑ Capital Institute, “The Patient Capital Collaborative—Field Study No 3. Field Guide to Investing in a Regenerative Economy,” http://fieldguide.capitalinstitute.org/uploads/1/3/9/6/13963161/ppcepub.pdf. 45. ↑ Jaromir Benes and Michael Kumhof, “The Chicago Plan Revisited,” International Monetary Fund Working Paper, August 2012, https://www.imf.org/external/pubs/ft/wp/2012/wp12202.pdf. 46. ↑ See Jackson and Dyson, Modernising Money—Why our Monetary System is Broken and How it Can be Fixed; See also: Positive Money, http://positivemoney.org/; On the Swiss initiative, see: Vollgeld-Initiative, http://www.vollgeld-initiative.ch/english; See also: http://www.initiative-monnaie-pleine.ch/. 47. ↑ See for example: http://www.lets-linkup.com/. For more information on Berkshares, see: http://www.berkshares.org/heroes/mohicans.htm. 48. ↑ The Peterborough Local Economic Trading System, http://ptbolets.50webs.com/greendollars.html. 49. ↑ For a detailed discussion of the role of government in achieving pro-environmental social change, see: Tim Jackson, “Motivating Sustainable Consumption: a Review of Evidence on Consumer Behavior and Behavioral Change” (London: Policy Studies Institute, 2005); Tim Jackson, “Confronting Consumption: Challenges for Economics and for Policy,” In The Political Economy of the Environment: an Interdisciplinary Approach, ed. Simon Dietz et al. (London and New York: Routledge), 189-212. 50. ↑ See for example, “Brazil Protest Erupt over Public Services and World Cup Costs,” The Guardian, June 17, 2013, http://www.guardian.co.uk/world/2013/jun/18/brazil-protests-erupt-huge-scale. Peter Victor, author of Managing without Growth. Slower by Design, not Disaster, is a Professor in Environmental Studies at York University. He has worked for nearly fifty years in Canada and abroad on economy and environment as an academic, consultant and public servant. 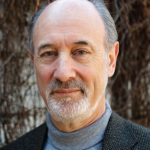 His work on ecological economics has been recognized through the award of the Molson Prize in the Social Sciences by the Canada Council for the Arts in 2011, the Boulding Memorial Prize from the International Society for Ecological Economics in 2014, and his election to the Royal Society of Canada in 2015. Peter was the founding president of the Canadian Society of Ecological Economics and is a past-president of the Royal Canadian Institute for the Advancement of Science. Prior to becoming dean of the faculty of Environmental Studies at York University in 1996 he was assistant deputy minister for the Environmental Science and Standards Division in the Ontario Ministry of the Environment. Currently Peter is a member of the Board of the David Suzuki Foundation and the Centre for the Advancement of a Steady State Economy, as well as belonging to several advisory boards in the public and private sectors. Tim Jackson is professor of sustainable development at the University of Surrey and director of the newly-awarded Centre for the Understanding of Sustainable Prosperity (CUSP). Funded over five years by the Economic and Social Research Council (ESRC), CUSP aims to explore the moral, cultural, social, political, and economic dimensions of prosperity on a finite planet. Tim currently also holds an ESRC Professorial Fellowship on Prosperity and Sustainability in the Green Economy (PASSAGE). He has been at the forefront of academic work on sustainability for over two decades and has undertaken numerous advisory roles on the social and economic dimensions of sustainability for business, government, civil society, and inter-governmental agencies. Between 2004 and 2011, he was economics commissioner on the UK Sustainable Development Commission, where his work culminated in the publication of Prosperity without Growth – economics for a finite planet (Routledge 2009/2016), which received wide acclaim and was subsequently translated into seventeen foreign languages. He was awarded the Hillary Laureate for exceptional international leadership in 2016. In addition to his academic work, Tim is an award-winning dramatist with numerous radio writing credits for the BBC.